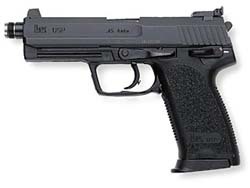 The KM USP Tactical is the starting weapon for Counter-Terrorists; but it is not exclusively available to the CT's; the Terrorists may purchase this gun as well from the Counter-Strike buy menu. It's rapid rate of fire, combined with it's powerful and accurate .45 caliber rounds make this pistol one of the best in the game. Tack on the option of adding a silencer whenever you want and it's quite clear why Valve chose to make this a Counter-Terrorist weapon (despite being a common sidearm for Swat-teams in real life). Although the silencer will muzzle your shots, it is only recommended in certain situations where stealth is a priority as it will decrease your rate of fire and weapon damage.